We have a bar in our basement. A sagging, rickety, orange shag covered bar. 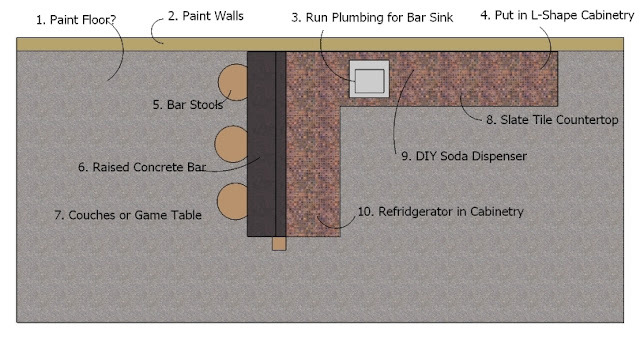 And while we love the idea of a bar in the basement, this one is definitely not going to make the cut! My husband is excited to be taking on this project. He told me what his plans were and I drew up this picture for him quite a while ago. We didn't really plan to start this project soon but wanted to have a plan in place (like we have for the kitchen!) We had been slowly collecting a few things and storing them in the basement until we would need them someday. Then it happened. We were at a flooring outlet this weekend to see if they had any tile (they didn't have much) but while we were there we saw they had a row of clearance cabinets. Marked down more than 50%. We'd been looking for second hand cabinets, but hadn't come up with anything cheap enough. We started doing a little math and saw that these clearance cabinets were coming in close to the price of second hand cabinets in our area. They were vanity cabinets so they were 2" shorter than standard kitchen cabinets, but we knew that would be close enough for our bar. We were seeing if they had the sizes we would need to feel the space, and an employee walked up and said he could take off another 30% if we buy today! Sold! We ended up spending about $325 for all the cabinets we needed. After that we went to Lowe's to use a 10% off coupon that was about to expire. We found exactly the tile we were looking for so we bought it (and paint for our master suite and guest room!) and rented a pickup from Lowe's to go pick up our cabinets. A friend helped us haul them to the basement. And just like that, we were ready to start tackling this bar. We went right to work and had the old shag bar ripped out in no time. Then after a little cleanup of the area we slid the new cabinets (and the countertop and bar stools we had already collected) into place just to get an idea of what it will look like. Not a bad start. And it was nice to see such a dramatic change in such a short amount of time. We went from the first picture to the last picture all in one afternoon. We still have a lot to do, obviously, but it is looking so much better down there already! Pretty sure the old bar was covered with family room carpet remnants from our first home. We used to have to rake it. Anyway, LOVE your remodel plan and the fact that you can already see just how wonderful the basement will be. What a great deal on cabinets too!